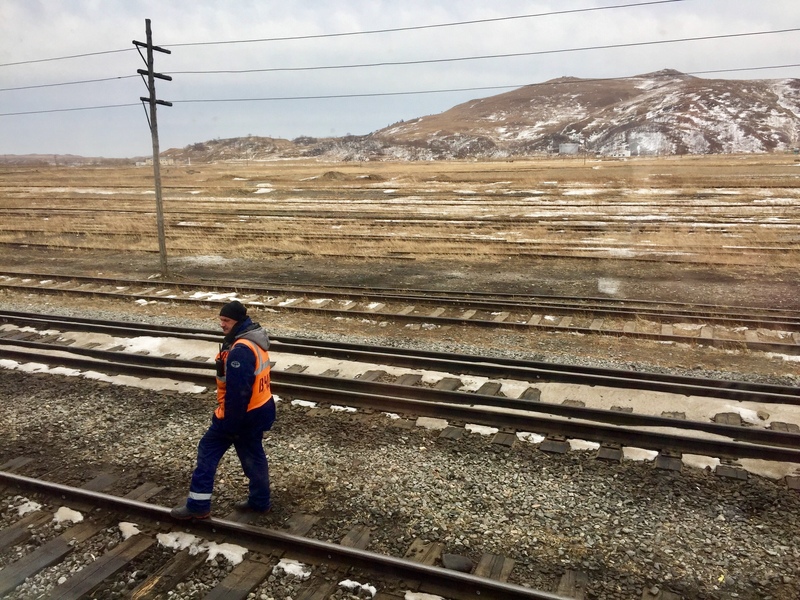 Looking at North Korea on the way to Russia via train. 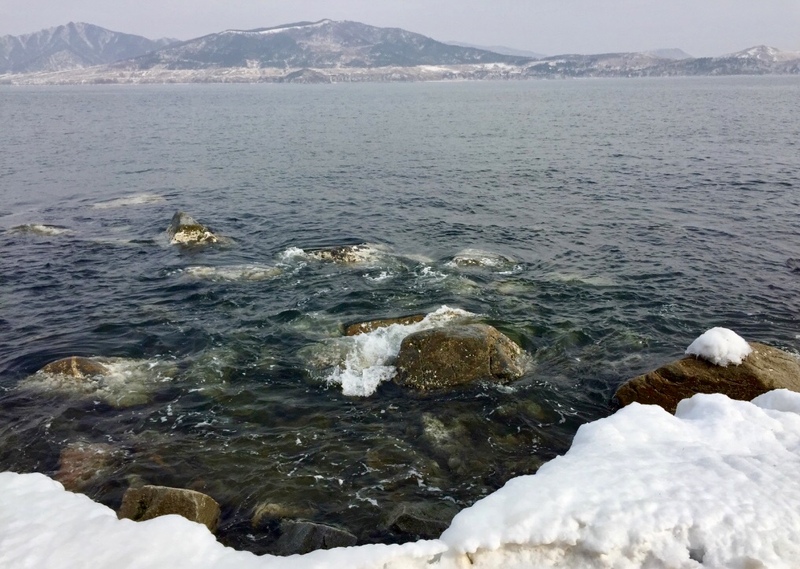 The original route of the Koryo Saram, the Korean people who migrated to the Russian Far East over 155 years ago from the province of Hamgyong in the very north of then-unified Korea, now stretches from the modern states of North Korea into the Russian Federation. Both the symbolic and de facto border separating the Choson dynasty-run Korea from the neighboring Qing dynasty-dominated China and the Russian Empire back then was (and still is) the Tumen river or Tumangang in Korean. 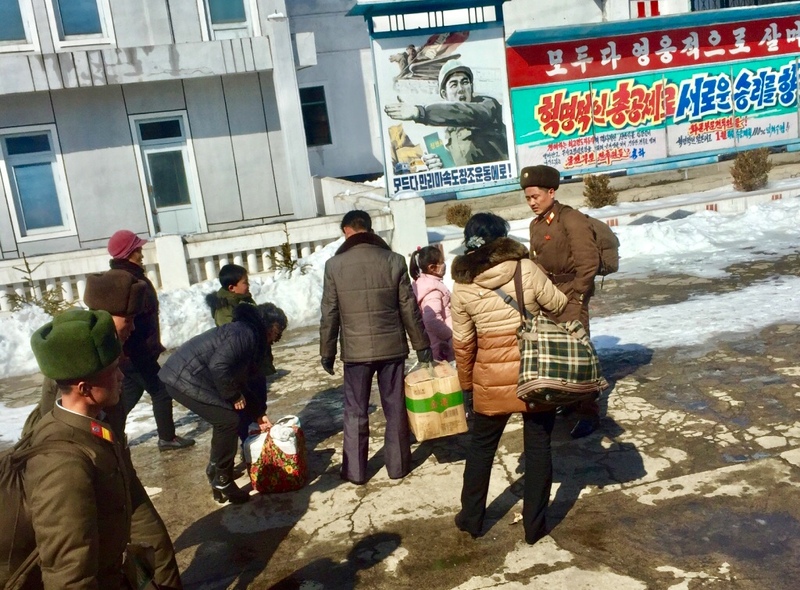 Leaving Tumangang behind and carrying out this historical one-way crossing – never to return back again – became the physical and philosophical countdown for Koryo Saram as a diaspora and the cornerstone of their self-identification as overseas Koreans based in the former Soviet Union and originating from the Far Eastern Russia. Nonetheless, this subconscious longing for Korea runs through the genes of the Koryo Saram and manifests in an acute curiosity toward the present-day DPRK, where their ancestors originally came from. As a researcher of the overseas Korean diasporas and the descendant of the Koryo Saram myself, this was a personal journey. 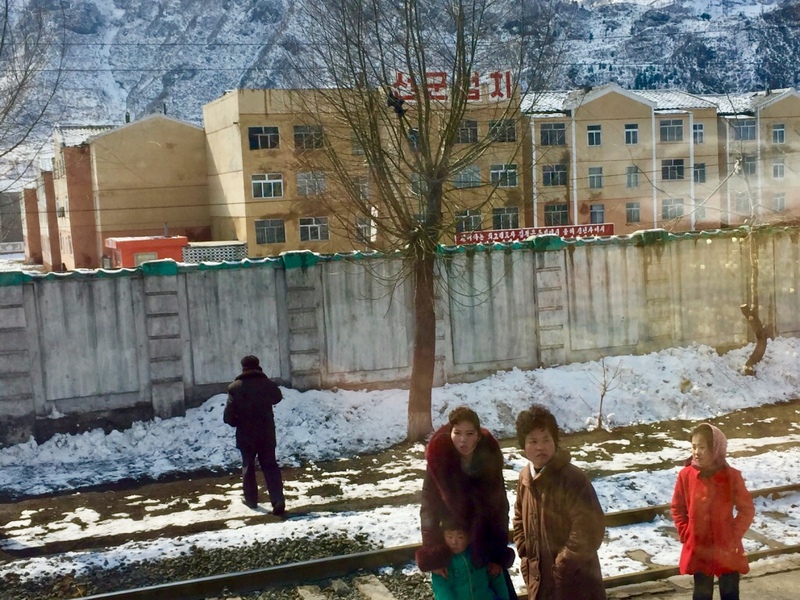 This particular voyage was a first for foreign tourists: boarding a regular North Korean passenger train all the way from Pyongyang to Vladivostok, crossing the present-day DPRK-Russia border over the Tumen river in the actual North Korean town of Tumangang and arriving at Khasan. We traveled the DPRK for a week, first from west to east – from Pyongyang to Hamhung – and then all the way up north along the coastline and to the very edge of the East Korea Bay – past the towns and fishing villages of South and North Hamgyong – to Kimchaek and Chongjin as well as the free economic area of Rason located on the present-day tri-border over the Tumen river. 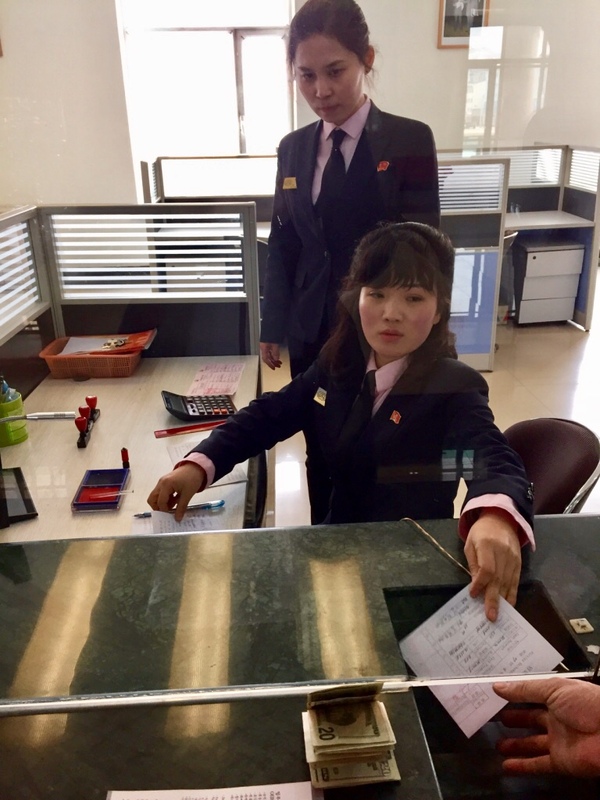 In the course of this journey, I tried to follow the lives of ordinary people – a task almost impossible for a “regular” tourist as any kind of official tourism in the DPRK is very strictly organized and controlled, with local guides accompanying us at all destinations, in each city and even on the road. Foreigners can rarely cross path with locals, “naturally” split from them by the parallel networks of communication and currency exchange. At the same time and paradoxically, maybe, the train also became a sort of window into the momentous reality. 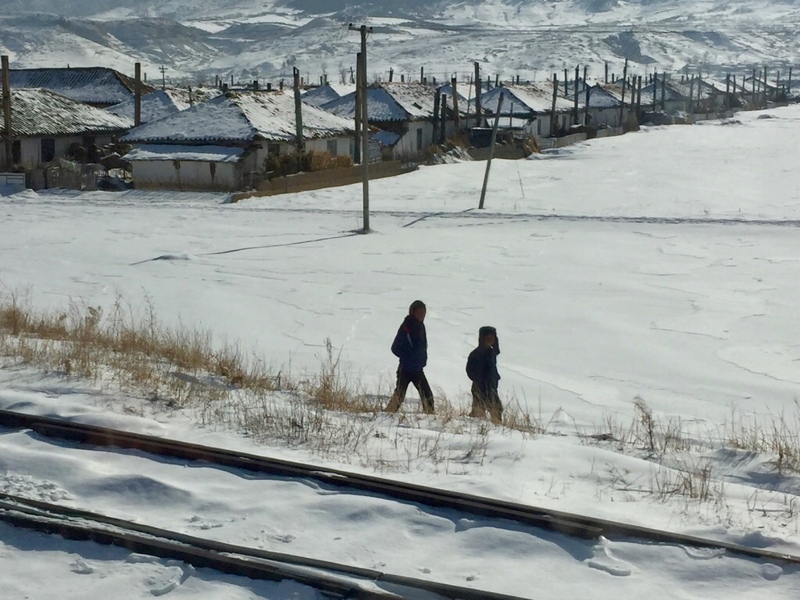 This is what I ultimately tried to gather and preserve – a photo-collection of people, memories, and moments on the road in North Korea on my way to repeat the historical crossing of Tumangang. Victoria Kim is a multimedia journalist and researcher from Uzbekistan. She previously wrote about the Soviet deportation of Koreans to Uzbekistan (available in parts one, two, three) and about General Nam Il, who signed the armistice on behalf of North Korea in 1950. 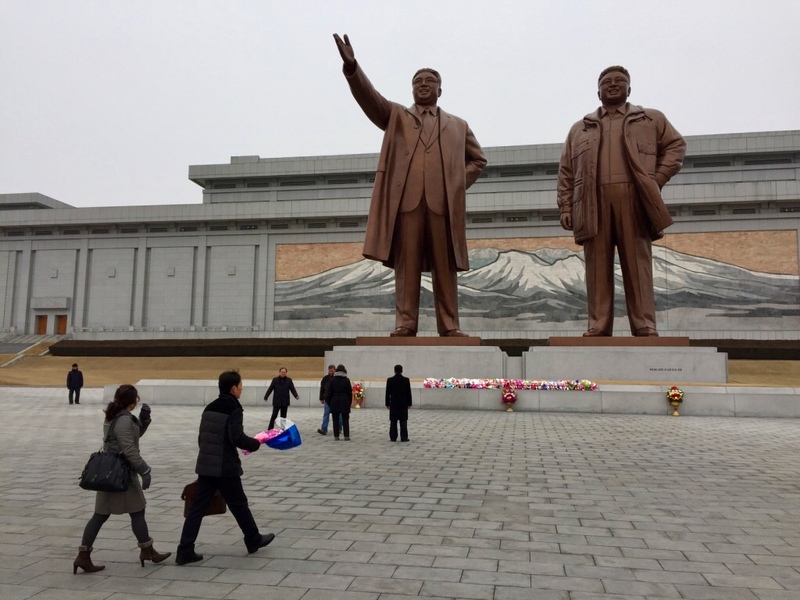 People laying flowers before the statues of Kim Il-sung and Kim Jong-il at the Mansudae memorial – a regular procedure for locals and obligatory for all tourists visiting the DPRK. 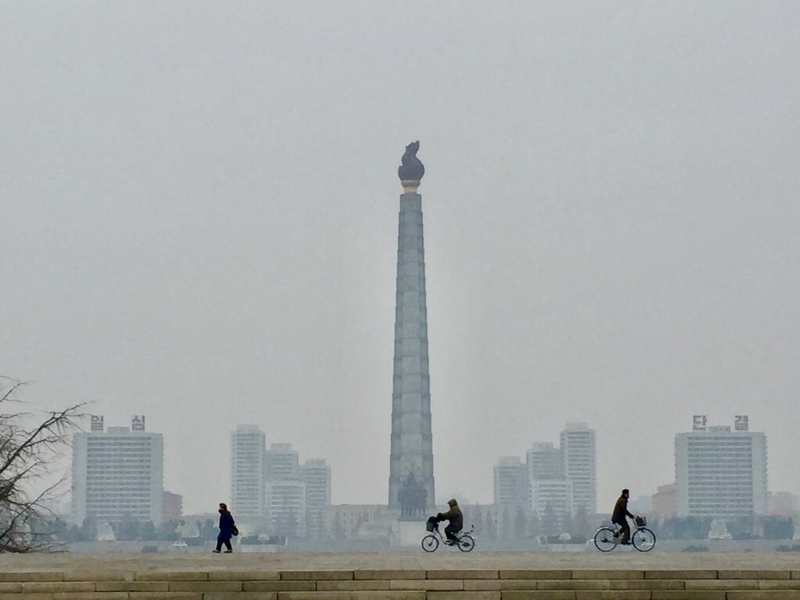 Locals riding bicycles in front of the Juche Tower. Bicycles are still the most common way of transportation in North Korea, in big cities and rural areas alike. 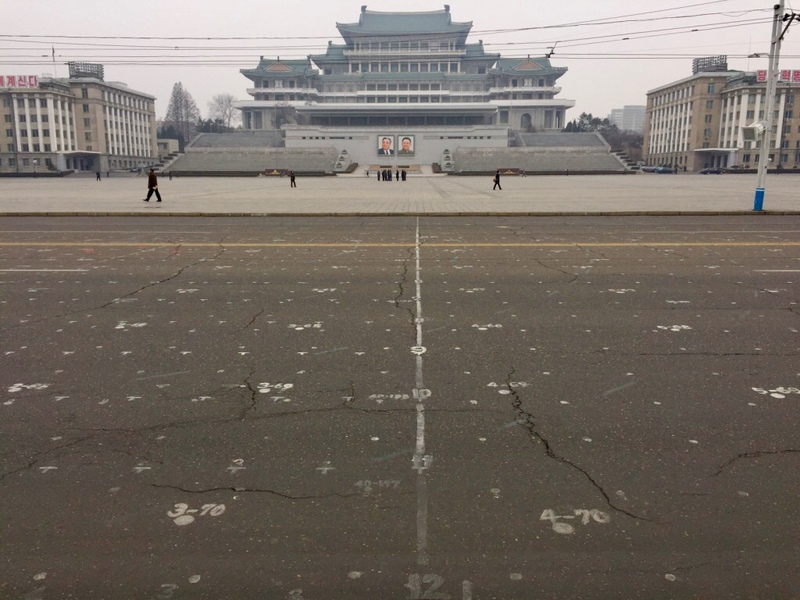 The view of Kim Il-sung Square – little dots on the ground mark each person’s position during all celebratory events honoring the leadership and important dates in North Korea. 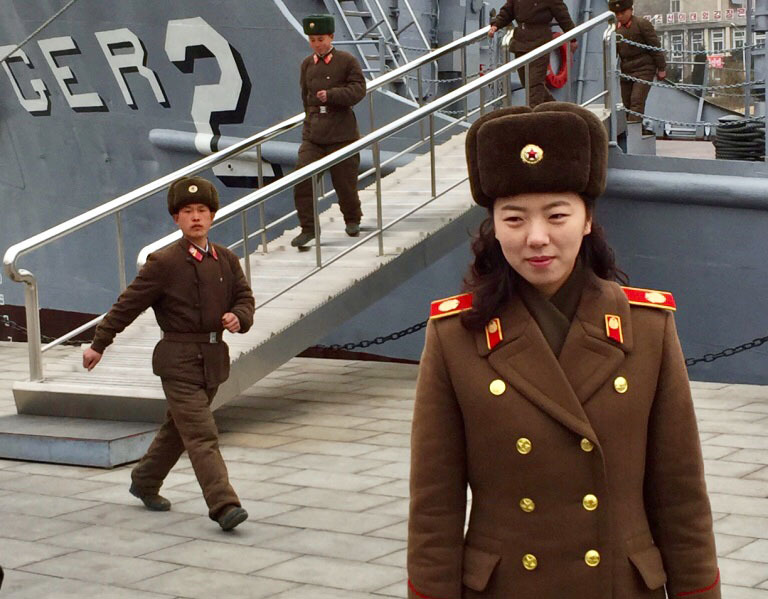 Our guide at the Victory Museum and North Korean soldiers exiting USS Pueblo – a U.S. research ship captured by North Korea in 1967 under suspicion of espionage. Visiting the ship is an obligatory part of the museum excursion. 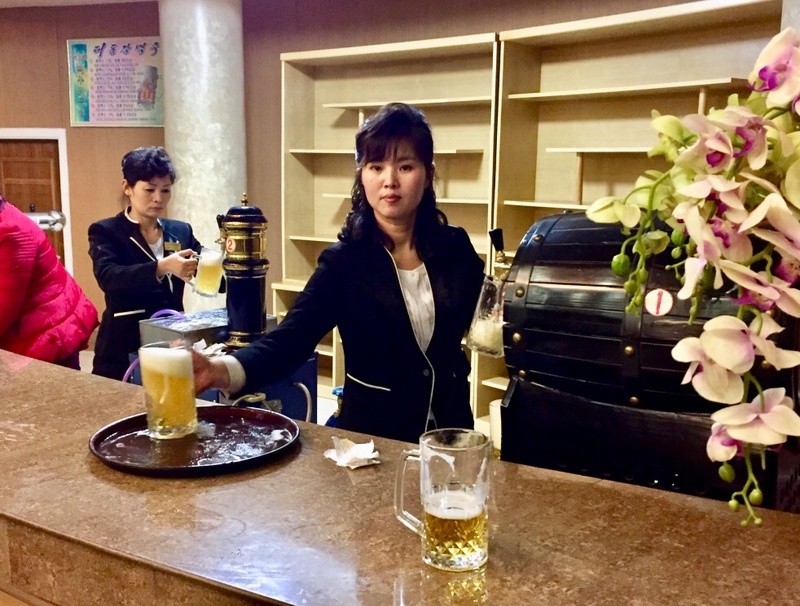 A barwoman serving beer at a craft-beer brewery in central Pyongyang. 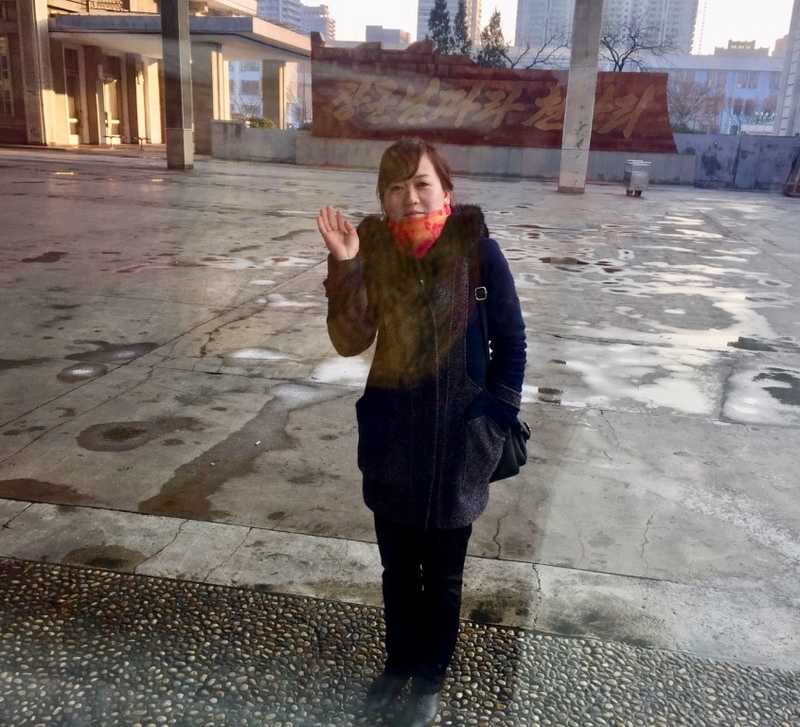 Our local guide in Pyongyang bidding me farewell on the train – farewell in its literal sense, as we will never be able to communicate with her by mail, internet, or over the phone. 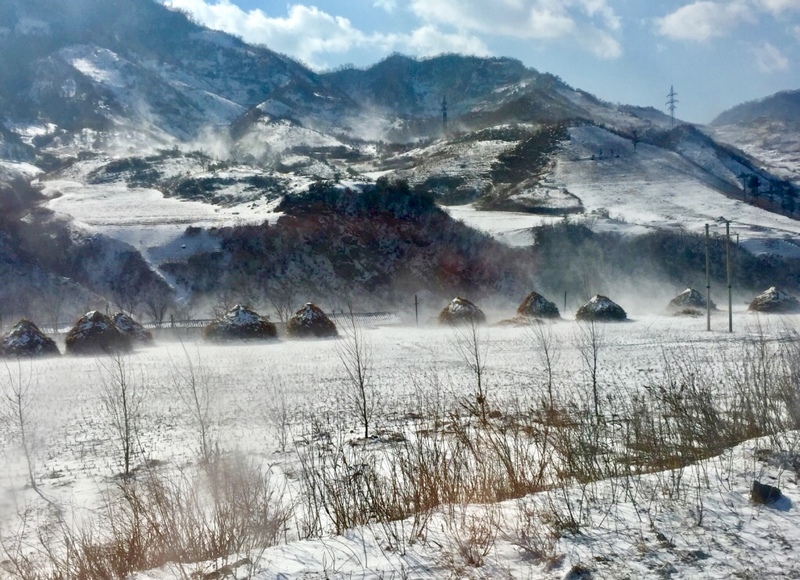 Landscape of South Hamgyong with the frozen piles of excrements and dung – an organic field fertilizer in North Korea procured with strict quotas all across the country. 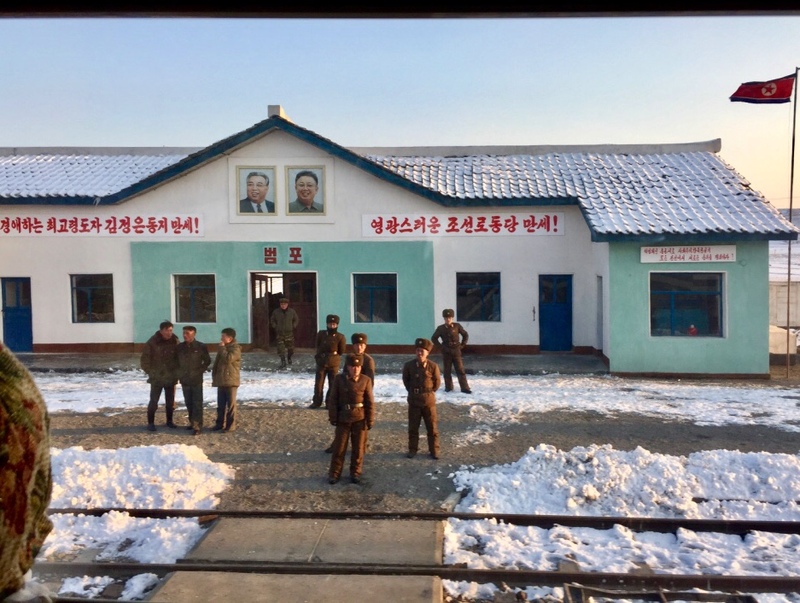 A simple looking train station in South Hamgyong with a single name on it: Yodok. A North Korean soldier with propaganda honoring Comrade Kim Il-sung in the background. 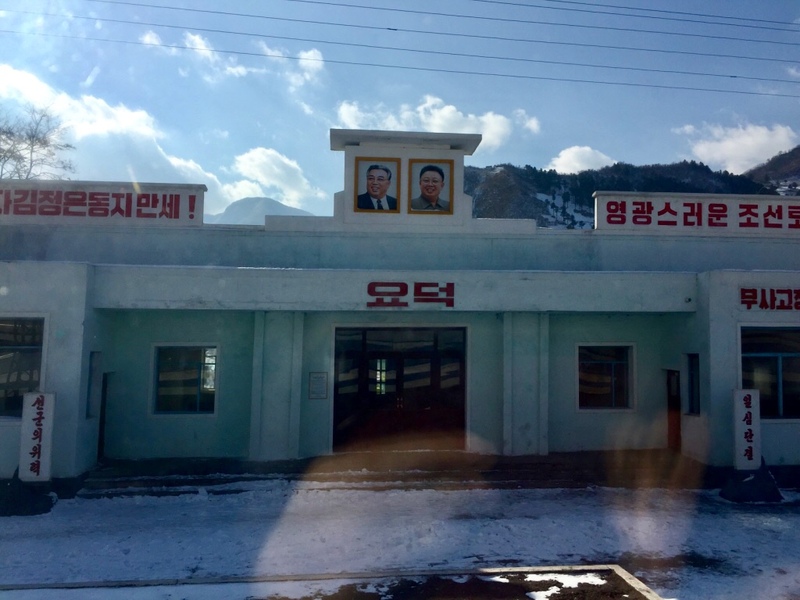 Pompo – another train station in South Hamgyong. 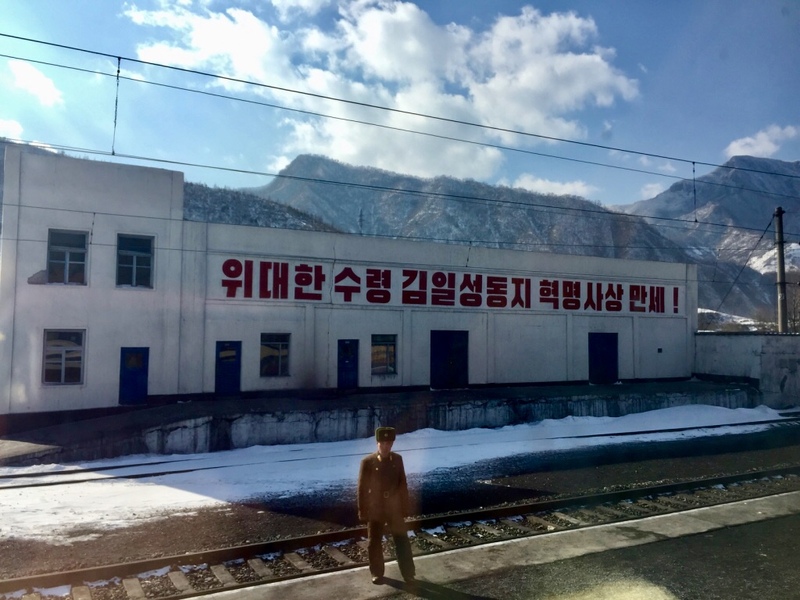 A huge military presence was visible at all railway stations in North Korea. Local residents at a train station. 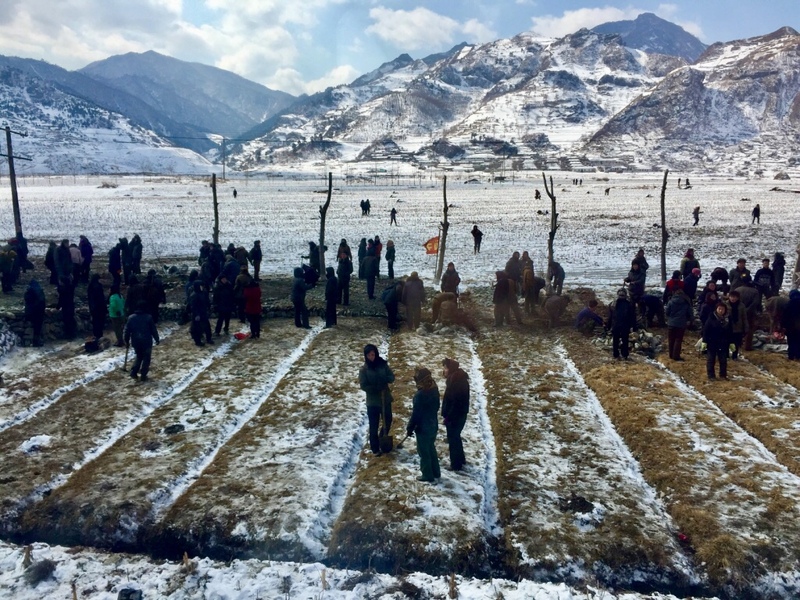 Winter fieldwork in South Hamgyong. Local residents near a typical village in North Hamgyong. 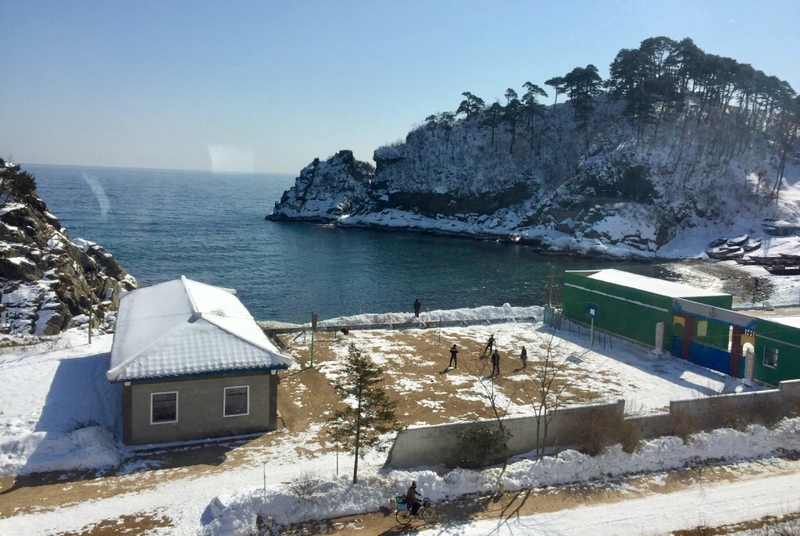 A basketball hoop nearby a fishermen’s village in North Hamgyong with a spectacular view of the East Korea Bay. 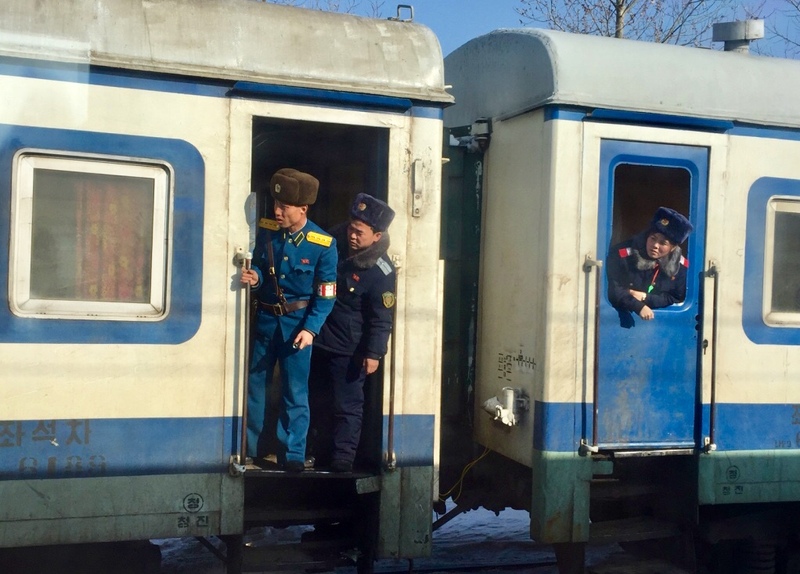 Train attendants and security guards searching through a train carriage in North Hamgyong. Local residents exiting the train station. Rajin station in Rason – the special-status city in the free economic area of Rason. 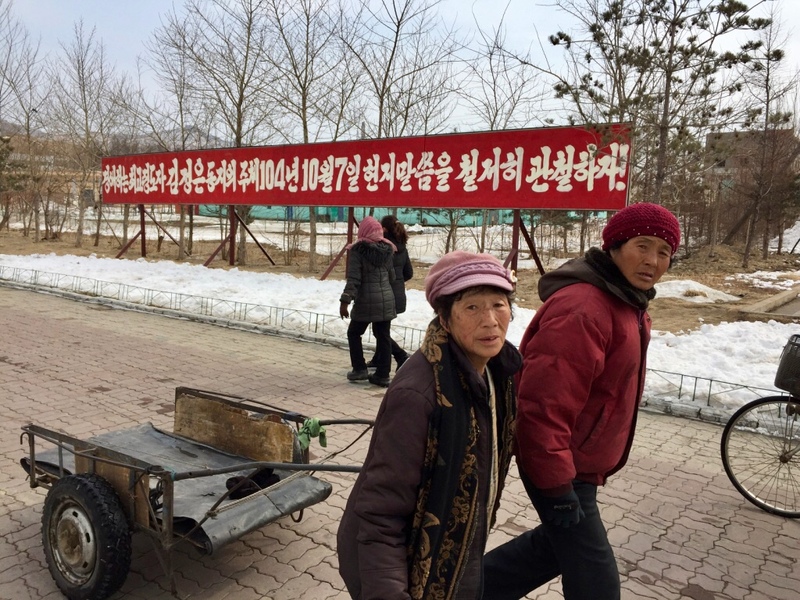 Local residents of Rason with propaganda honoring Comrade Kim Jong-un in the background. 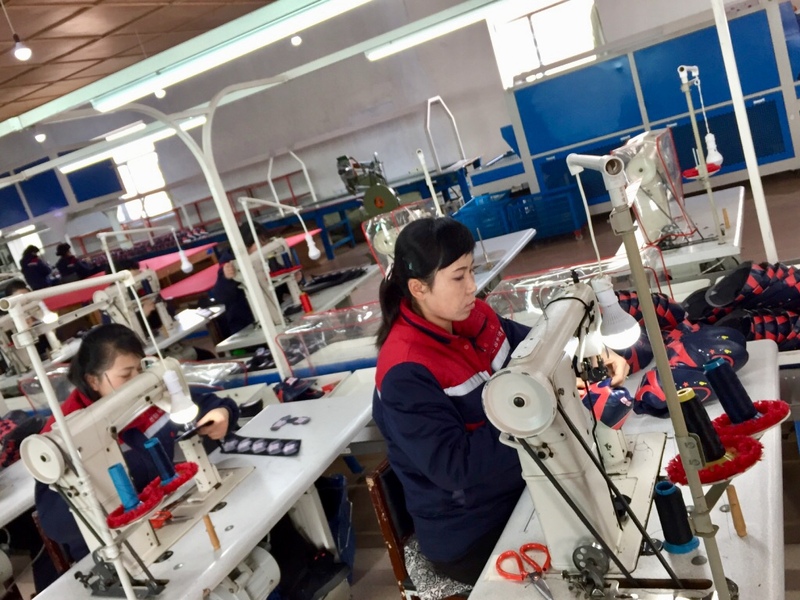 A new shoe factory in Rason. Golden Triangular Bank in Rason, where we were able to exchange U.S. dollars and euro into Russian rubles. Five foreign currencies currently circulate in Rason, including the Japanese yen and Chinese renminbi. 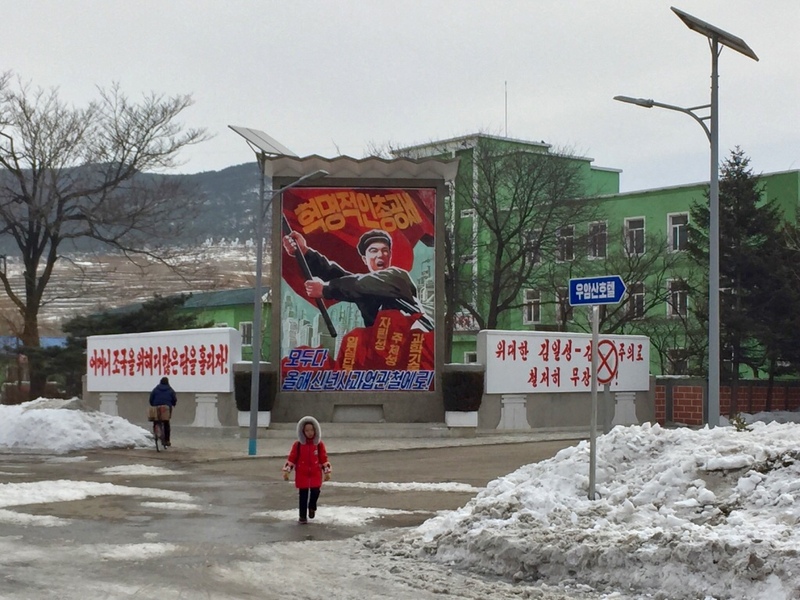 A little girl walking to school in Rason with a regular hand-painted street propaganda in the background. 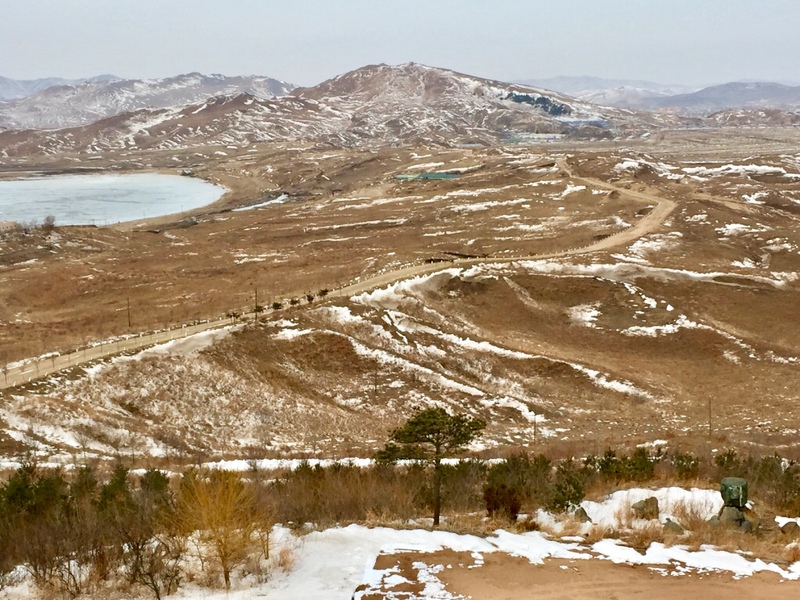 A view of the road to Tumangang across the East Korea Bay from Pipha Island in Rason. 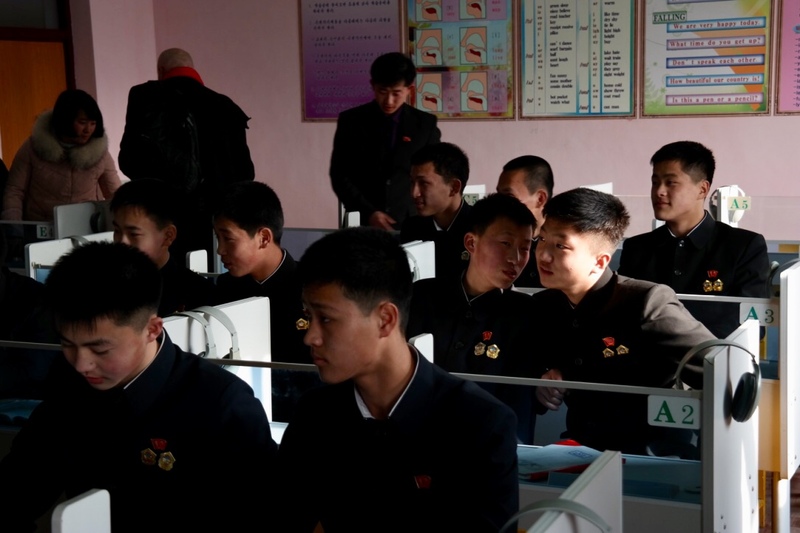 Secondary school students in Rason, the majority of whom dream of entering the North Korean army (as found out during the permitted half an hour English-language communication session). 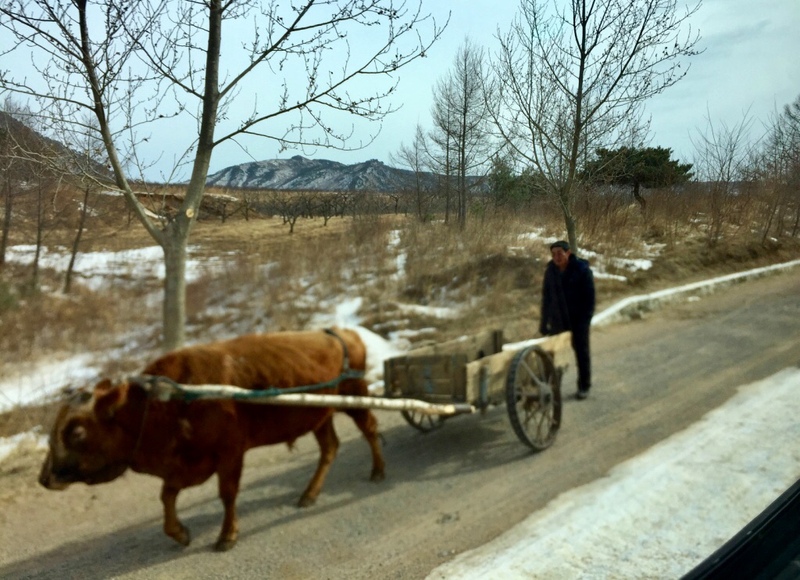 Ox carts are another regular type of transportation in the North Korean countryside, along with bicycles. 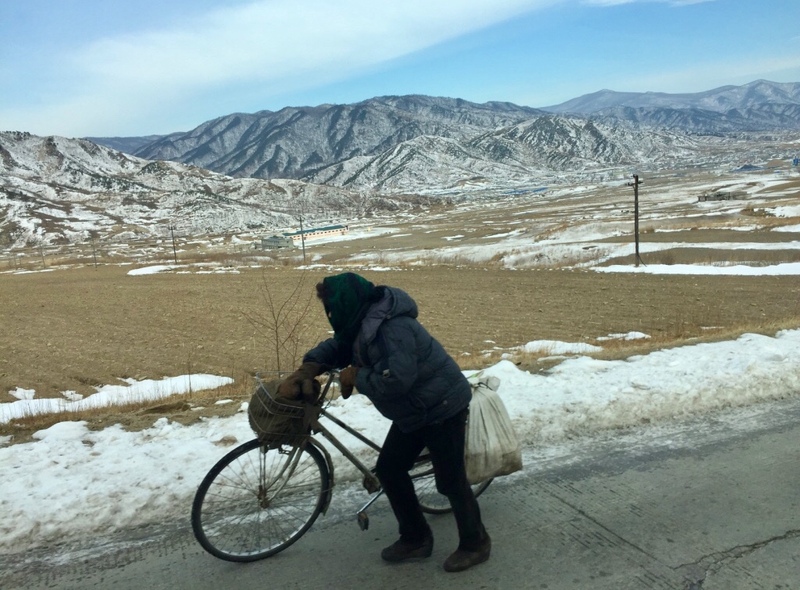 A bicycle rider on the road to Tumangang. 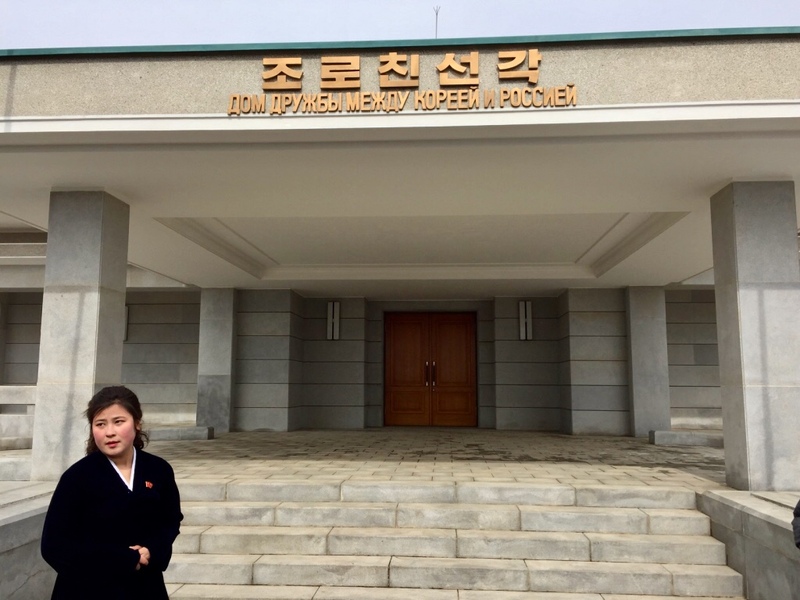 Friendship House on the DPRK-Russia border, where North Korean and Soviet/Russian leadership regularly met in the past. 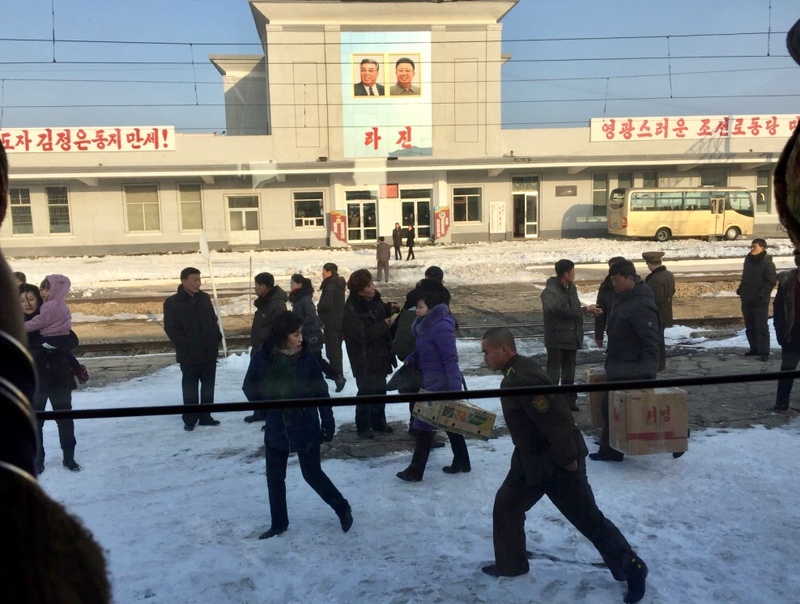 A tri-border area with China and Russia in the very north of the DPRK. 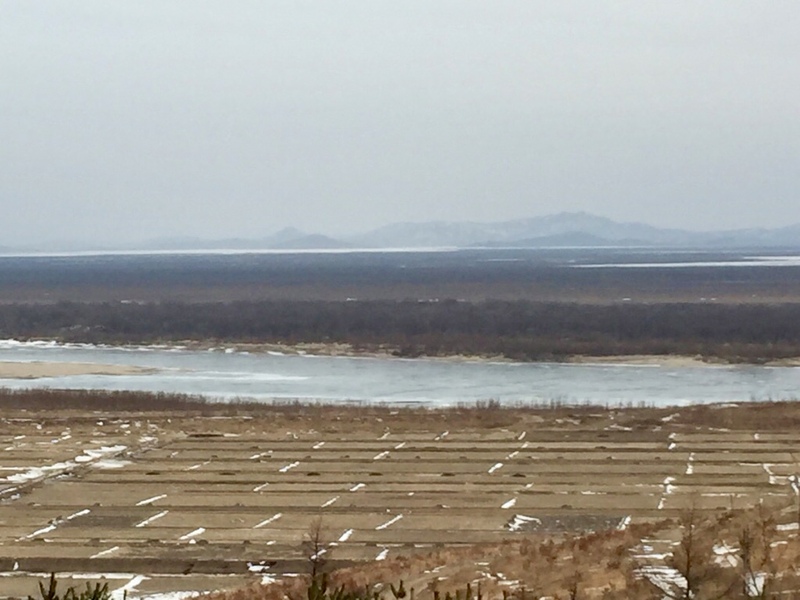 Tumangang or the Tumen river – the historical border between North Korea and Russia trespassed by Koryo Saram over 155 years ago – with a view to the Russian Far East in the background. Russian section of the railway near Khasan with a Russian worker on the rails. Before the summit, both Trump and Kim arrived in Singapore for meetings with Prime Minister Lee.